In this blog we would like to introduce two open source helpers to create test data for abap unit tests. Regardless of using the test first or test last approach in ABAP, we have to provide test data for our unit tests. This process can be very time consuming depending on what has to be provided. Imagine your method under test has a “simple” signature with an obligatory table of flights as importing parameter. This table must contain n lines, to reproduce a bug in coding. it would be nice to have a feature which exports this already given data from current debugging session context in such a convenient way, that this export can be used very easy in our ABAP coding. Therefore we have developed two nice debugger enhancements. One enhancement is used to export table data and the other export data from structures (which also could be very long) . Here you can see how values of an internal table can be “exported” very easy during debugging. For exporting long structure data you need to view the structure in the debugger tab “Structures”. From here it is the same procedure as for internal table (see above). We have been searching for a lightweight way to enhance the “new” debugger, to provide needed functionality. Lightweight means, achieving the goal without a modification or a copy paste of SAP function groups. Unfortunately we haven’t found any useful customer exits in SAP ABAP debugger coding. So we decided to use the enhancement framework and it’s implicit enhancement capabilities. You will find one enhancement for table data view (Enhancement zenh_table_values) and one enhancement for structure data view (Enhancement z_struc_v_build_services_menue). Corresponding for each enhancement there will be one ABAP class for table data enhancement (Class ZCL_DEBUG_DATA_VIEW_TABLE_ENH) and one class for structure data enhancement (Class ZCL_DEBUG_DATA_VIEW_STRUC_ENH). 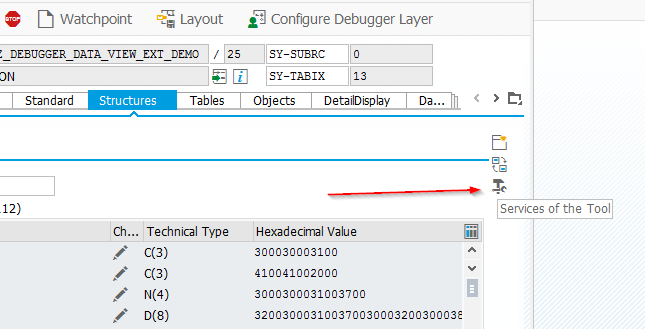 There is also the report Z_DEBUGGER_DATA_VIEW_EXT_DEMO included in the package to give you an easy way of checking the described functionality. Just place two breakpoints in it, run it and try to use the new debugger functionality. Our implementation is using class CL_DEMO_OUTPUT and class CL_DEMO_INPUT. Those two classes are marked as only for demonstration programs and can’t be used in production programs. As we write tests in development systems and usually get tesatdata from test systems, no productive systems are involved. Nevertheless it is planned to provide own Dynpros, see section “Possible enhancements to current solution”. As we use the new VALUE operator, the minimum ABAP version you need is a 7.40. The demo report is using SFLIGHT table for data selection. If this table is empty in your system, the demo report will be useless. So you can check functionality with any equal approach. Please use abapGit to get this coding to your system. Pull Requests (and Issues) on GitHub are welcome. I debugged the debugger some years ago, as far as I remember the debugger is built on a nice extensible framework, it is just not possible for customers to extend it without enhancements(? ), I hope SAP will open for this possibility some day. Really nice tool! First thing that came to my mind was whether this would also be possible with ABAP debugger scripting. Did you try that? Very nice! I can’t use it now – but I sure am bookmarking it. Paul Hardy This would help with those pesky tests. The concept here is excellent. The nature of the implementation does not matter that much. ABAP Debugger scripting also occurred to me as a way to extend the debugger without enhancements. I encourage everyone to look into this – you would not believe how powerful that framework is. This is the hundred ton elephant in the room that no-one knows about. I had a chapter about this (Debugger Scripting) in the first edition of my book, but had to remove it from the second edition as there just was not room. Nice job! You are so cool!